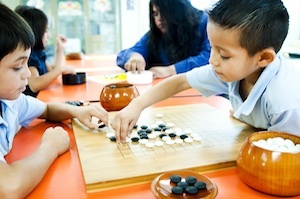 Students at the St. Joseph Mission School in the village of San Fidel (nr Laguna) are learning to play Go. The school located about 60 miles west of Albuquerque with an enrollment of 41 students, serves the community of San Fidel as well as the Pueblos of Acoma and Laguna. At present, the student body is 95% Native American. The club meets on Thursdays as an after-school program. About 24 students (grades K-7) regularly attend. Parents and school staff have been known to drop in on occasion. Club meetings begin with a short mini-lesson, followed by individual play. Zach Garcia leads the Go lectures, while the 3-4 grade instructor, Mr. Kuhn, spearheads chess tactics. Participants may switch between games at their leisure. All students understand the First-to-Capture variation, while a handful of players have moved on to 9×9 games with Japanese scoring. The club is very fortunate as our Parent-Student Association continues to fund their program. The club recently purchased new equipment from the AGF, as well as t-shirts with our logo.